Rugby Town’s promotion hopes suffered a double blow this week by first losing further ground at the top of the UCL Premier Division followed by the confirmation that leading scorer Danico Johnson has left the club. The week did at least end on a more positive note for Valley when they recorded a 2-1 victory over Leicester Nirvana at Butlin Road on Tuesday, after last Saturday’s unexpected 2-0 reverse against struggling Northampton ON Chenecks had seen the gap between them and leaders Daventry lengthen to ten points. Daventry followed up on their comfortable 4-0 home win at the weekend against bottom team Wellingborough Whitworth with another three points at second bottom Kirby Muxloe on the same evening that goals from Rugby’s Lewis Rankin and Liam Francis gave them revenge over a side that they had previously lost to twice this season. Meanwhile Johnson called time on his prolific spell at Town after the Northampton defeat by signing for Southern League Premier team Redditch, although Valley boss Carl Adams has moved swiftly to replace him by securing the services of striker Edwin Ahenkorah from Redditch’s divisional counterparts Rushall Olympic. 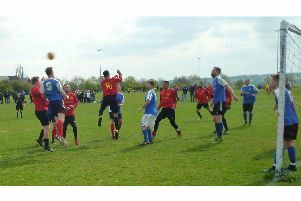 Arriving in the summer with a reputation for regularly moving around the Midlands non-league football scene, Johnson made an instant impact with a hat-trick on his Rugby debut and went on to score 20 times in just 26 starts for the club - although Saturday’s blank against Chenecks had extended his run without a goal to five matches. His replacement, the 24- year-old Ahenkorah, played for Town boss Carl Adams for three seasons at Stratford scoring 36 goals in 113 games there, before leaving Knights Lane for Rushall in September 2019. Adams blooded his new striker immediately in Tuesday night’s victory as the central man of a front three alongside Charlie Evans and Rankin - with the latter maintaining his impressive scoring form of late with his 13th strike of the league campaign. Next-up for Town is the visit to Butlin Road this Saturday of mid-table Peterborough Northern Star. Johnson’s opening day treble came as part of a comfortable 4-0 win in the reverse fixture between the two sides at the Branch Bros Stadium at the beginning of August. Peterborough have registered a mixed bag since then and go into Saturday’s game in 12th place with nine wins from their 22 UCL games so far. Daventry travel to Wellingborough Town on Saturday to face a side that managed a draw against them recently at Communications Park, whilst third placed Deeping - who are now five points behind Valley with two games in hand on them - host Kirby Muxloe. Another player to have left Rugby is midfielder Lewis Hayden, who has joined up with MFL Division One side Racing Club Warwick. Hayden signed for Valley from Walsall Wood last September and featured 18 times for the club before moving on.